This shirt takes me back to my school days. It reminds me of the Chelsea F.C. Away 2007/2008 shirt that I seemed to somehow mange to wear every day for about six months straight. Striking colours have always piqued my interest when it comes to football shirt design. I love the seeing people's reaction to me wearing them, as they mutter to themselves, so he's the reason why club's release these types of shirts. As for this shirt, the highlighter yellow and purple work together well. The sponsor doesn't look of place on the shirt either. Other than that it is quite a plain shirt but I'm glad it's part of my club football shirt collection. Anderlecht colours are purple and white, and the club's home kit is generally white with purple trim, though they did wear a black and purple home kit in the 2005–06 season, and a grey in the 2007–08 season. In the beginning, purple was the main colour of the shirts. The motto of Anderlecht (Mens sana in corpore sano) is written on its badge as are the three letters SCA referring to the initial name of the club (Sporting Club Anderlechtois). A crown was added in 1933 following the name change to Royal Sporting Club Anderlechtois. 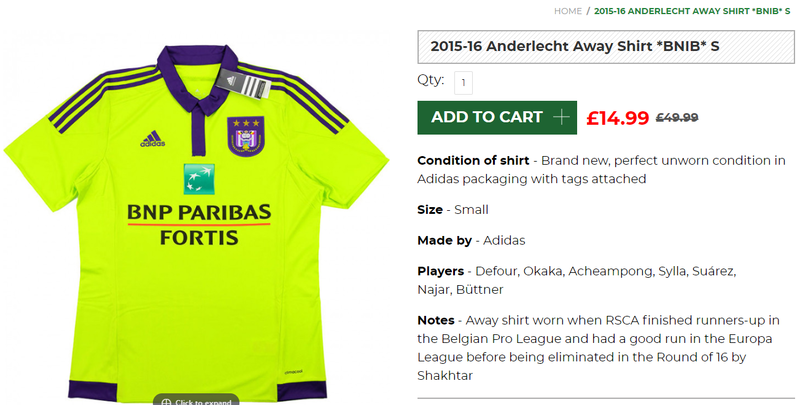 Anderlecht's colours inspired those of Al Ain FC in the United Arab Emirates.